So you’ve listened to Kotaku Splitscreen and are wondering just what the hell this “Trails” thing is and why you should care. Fear not. We’re here to help. For years now I’ve been preaching about the Trails series to anyone who will listen, mostly because it comprises some of the best modern JRPGs you can play today. Here, then, is a guide to how to start getting into this wonderful series. Trails, called Kiseki in Japan, is a longrunning RPG series developed by a company called Nihon Falcom (best known for the Ys action games). The names are all saddled with the generic preface “The Legend of Heroes,” a relic from the 90s that just serves to make things more confusing. There are some other games with that “Legend of Heroes” title, which you may have seen published by Bandai on the PSP, but you can safely ignore those. The Trails series truly started with Trails in the Sky, which first launched in 2004. There are currently seven games in the Trails series, with an eighth on the way next year, but only four have been released outside of Japan. (The fourth is out today!) The entire series takes place in a single world with its own political landscape and shared history, not unlike Suikoden, but you don’t have to play them all to enjoy them. Different games in the series play around with different mechanics, but they all share some common characteristics: They’re all big, beefy RPGs with turn-based combat and twisty, meaningful stories. They’ve all got great characters and, thanks to the localization efforts of publisher XSEED, the writing in all of the games released in English so far is spectacular. The Trails games also reward you for paying attention. The more you play and learn about the lore of this world, the more you’ll enjoy each subsequent game, like unraveling a great fantasy novel or TV show. Even the NPCs have names and personalities. This is a series designed for the type of RPG fan who likes to take their time, to explore, to enter a brand new town and talk to everyone possible. It’s designed for people who love mystery, gradual plotting, and excellent story-telling. The best way to think of Trails is as a collection of three sub-series. Each of these sub-series is set in a different country, and there are plenty of references and character crossovers, but you can play each one on its own. There are three sub-series in Trails so far, although not all of them have come to the U.S. yet. There’s the Sky series, the Crossbell series, and the Cold Steel series. This is the first and oldest subseries. The first two games tell the story of Estelle and Joshua Bright, two adventurers who go on a wild romp through the country of Liberl. Both of those games are already out in the U.S. for PSP and PC. The third game, which is more of a standalone adventure, will be out for PC in North America early next year. This duology is set in the country of Crossbell and has not yet been released in North America. Publisher XSEED has expressed interest in localizing this subseries, but that’ll depend on sales of the other games. For now, it’s best not to worry about them. This is the most modern Trails sub-series, which makes it a pretty good place to jump in. It’s set in the militaristic nation of Erebonia, and stars a group of schoolmates called Class VII as they find themselves entangled in an increasingly violent political conflict. The first game, which came out for PS3 and Vita last year, is set in school and sort of resembles a cross between Suikoden and Persona; the second game, which is out for PS3 and Vita today, is set after... uh, graduation. Trails in the Cold Steel III is still in development and probably won’t be out in North America until 2019. The Crossbell and Cold Steel series take place around the same time, and they both reference one another a fair amount, so here’s hoping we get to play Azure and Zero at some point in the future. 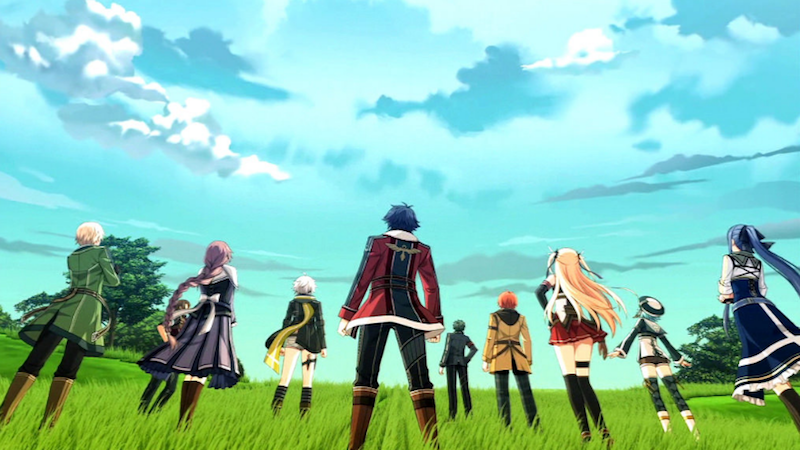 Start with Trails in the Sky FC: Because it’s awesome, and why not start from the beginning? Start with Trails of Cold Steel: Also a good option! Cold Steel has some pacing issues but is a great game overall and a solid place to jump into Trails. You should not play Trails in the Sky SC or Cold Steel II without playing, respectively, Trails in the Sky FC or Cold Steel. You will be confused and unhappy. Both SC and CSII are direct sequels, taking place immediately after their predecessors, and playing them first is akin to starting a novel on page 200. But if you do listen to my advice and jump into either FC or Cold Steel, you’re in for quite the ride.